This post is sponsored by Café Appliances and Gerhard’s Appliances. All content and statements are my own. I’ve found myself working on a lot of kitchens lately for my e-design clients and it’s been really fun! They’ve all been so different in terms of style. I’ve designed everything from a two-toned refresh with navy and white cabinets to a full renovation with taupe cabinets and leathered black granite countertops. Each one is unique and tailored exactly to the look, feel, and lifestyle of the people who live there - as it should be! Kitchens are a big investment and they’re serious workhorses for our homes, so it’s 100% worth spending some time and energy designing all the little details. After all, you’ll be living with those decisions for a long time - make them good ones! Since kitchens have been on my brain a lot recently, I thought it would be fun to talk a little bit about two very different styles: light and bright vs. dark and dramatic. I’ve got a pretty amazing example of each version to share with you and we’ll talk through some of the major pieces that give each kitchen its signature look. At the end, I’d love to hear which style you’d lean towards if you were designing your own kitchen! The first major element that has a major impact on the look and feel of a kitchen is the white shaker cabinets. They occupy so much real estate in a kitchen and set the foundation for the light and airy style - they’re clean, classic, and will definitely stand the test of time. But, they’re definitely not the only element that gives this kitchen that signature light and bright look. There are lots of supporting players as well including the light wood flooring, marble-like countertops and backsplash, white walls, and my personal favorite, those matte white appliances! Let’s talk about those for a minute since they really are something special. How often do you find yourself saying, “Wow, those appliances are absolutely gorgeous!” I’m guessing it’s pretty infrequent! In fact, I feel like the appliance world has generally been a little behind the times in terms of designing refrigerators, ranges, dishwashers, etc. that enhance and elevate a kitchen’s style, rather than just being utilitarian. That’s no longer the case thanks to Café appliances, which is what you see in this kitchen here. By the way, if you happen to live in the Philadelphia area like I do, you can go check these beauties out at Gerhard’s Appliances. It’s worth going to see them in-person (they have five locations to make it easy on you!) and to be able to talk with the helpful folks there about all the options available to you. I love it when I can support local retailers, and Gerhard’s has been around for over 70 years, so you know they can be your trusted source for all things appliances! 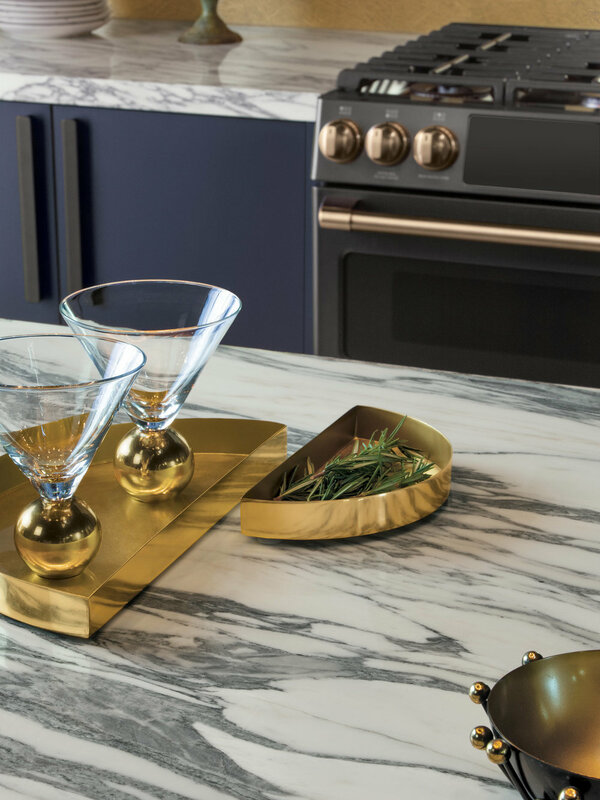 Another cool thing about Café Appliances is that they offer the opportunity for customization with their knobs and handles, so you can truly take your kitchen to the next level (woohoo!) to create a space that reflects your personal style. Here, the matte white version has a brushed bronze handle, which coordinates beautifully with the brass cabinet hardware, lighting, and faucet. Do you see how that one simple design choice allows the appliances to blend seamlessly with the other elements? Since you can select the finish, Café Appliances gives you the chance to perfectly integrate your appliances (or have them stand out and be the star!). Let’s finish up with a couple of other details that gives this kitchen that light and bright look. 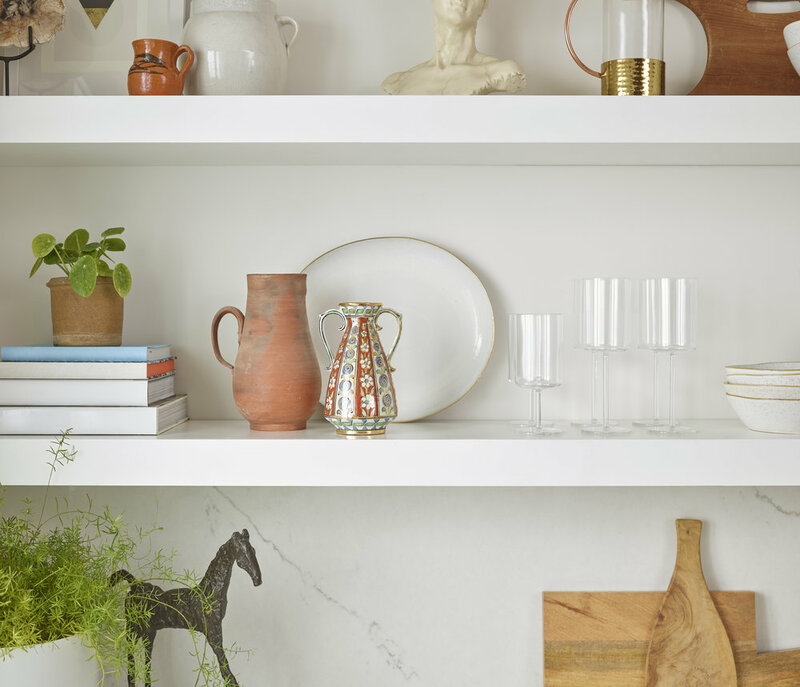 One major element that caught my eye was the open shelving on the range wall. I know the open shelving look isn’t for everyone, but if you’re up for it and it works in your kitchen, a little bit of open shelving (rather than more upper cabinets) goes a long way in making it feel open. The final piece is actually something you might not expect - the green island (which I absolutely love!). I think every space that has a light and airy style needs at least one “grounding” piece to keep it from feeling like it will just float away. Here, that’s the dark contrasting island. With everything around it being white, it gives you an anchoring point to rest your eye while taking in the rest of the space. Now let’s move on to our other kitchen! On the other side of the style spectrum, we have a moody, high contrast kitchen. This space is absolutely stunning and has a completely different feel to it! So what elements give this kitchen that dark and dramatic look? I think it’s the combination of different colors, textures, and patterns. Let’s start with the foundation - those navy blue cabinets and black appliances. Navy and black has become one of my very favorite color combos in recent years. I think it’s the subtle contrast between them that gets me. Somehow it’s both sophisticated and laid back at the same time. 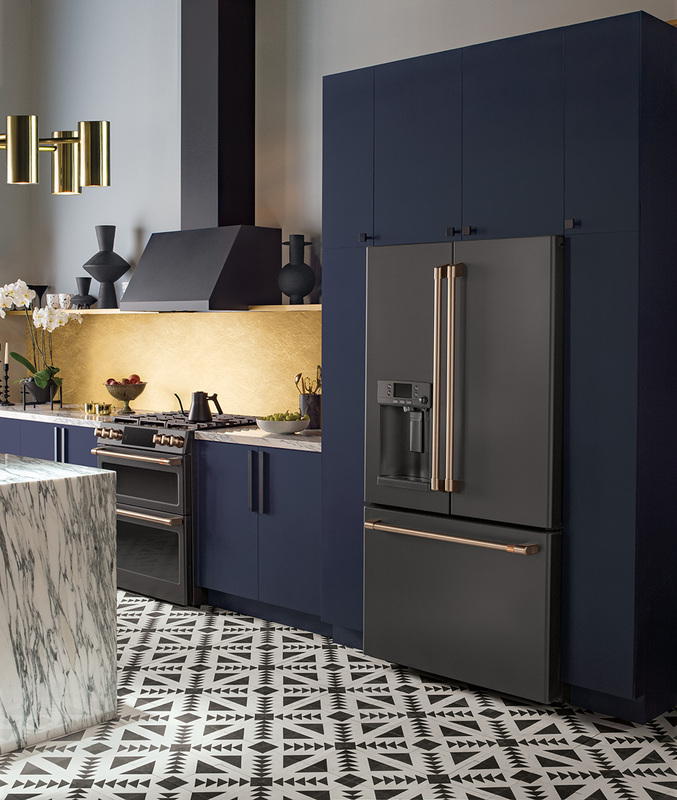 I absolutely love the hits of black throughout this space - you see it in everything from the cabinet hardware, tile floor, range hood, and the matte black appliances. These black appliances are again from Café Appliances and have the same customization options as the white ones in the other kitchen (you can find both versions at Gerhard’s!). Since drama is the name of the game in this kitchen, brushed bronze handles and knobs are the perfect pop against the black. 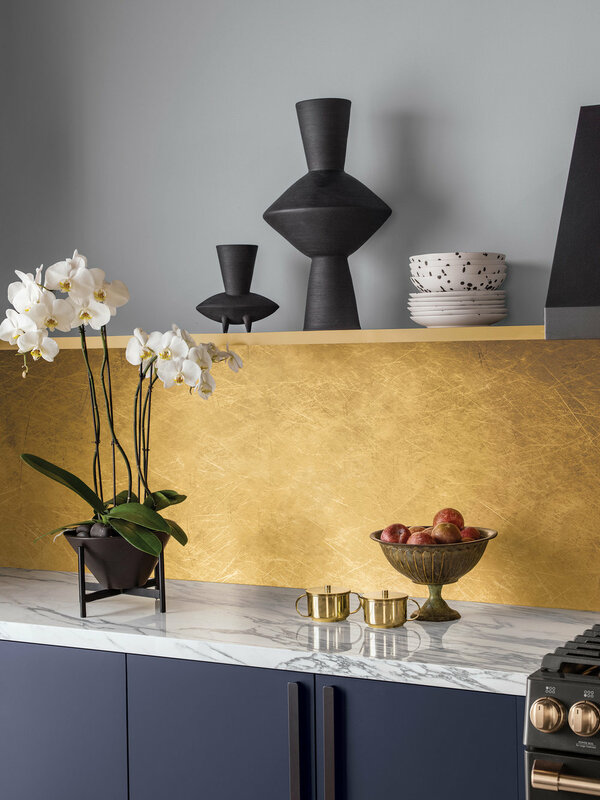 They tie in to the other seriously dramatic part of this space - the gold backsplash! That’s one of the major elements that brings in that texture I mentioned earlier. Isn’t it lovely? Pattern is the last key to pulling this look together, and you’ll find it in full force in those black and white countertops and tribal-style tile floors, as well as the heavy veining in the countertops. They’re both slightly unexpected and I love how they add so much movement to the kitchen - there’s nothing boring about this space! It’s pretty daring, but in the right house, I think it could be really amazing. So, which look is more you? If you had to pick one of these kitchen styles for your own home, what would you do? They’re completely different, that’s for sure, and I bet you were immediately drawn to one or the other. Light and bright is definitely my default look (after all, it’s what I did in our big kitchen reno a few years ago), but there’s something about the dark and dramatic kitchen that’s hugely tempting for me. 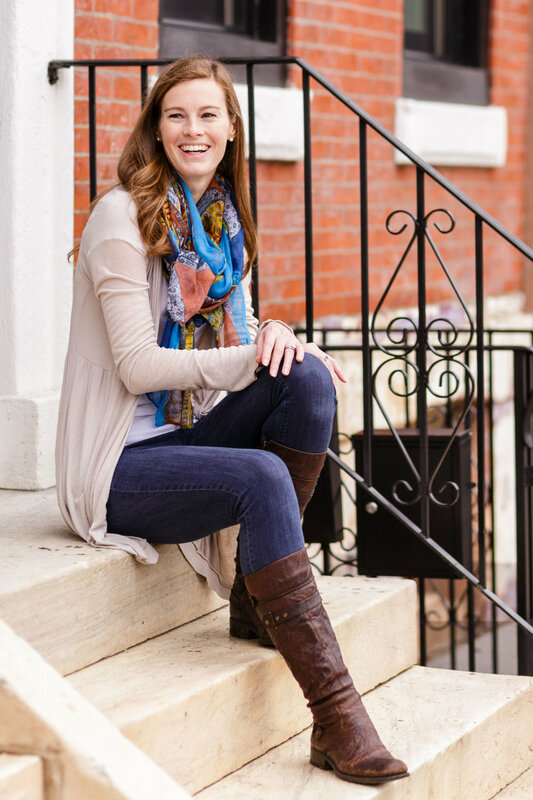 Of course, there are tons of in-between options as well, but I thought it would be fun to talk about these two opposite styles specifically today. Ultimately, your kitchen should be a reflection of you, and when you’re designing it, you have a huge opportunity to make it exactly what you want. 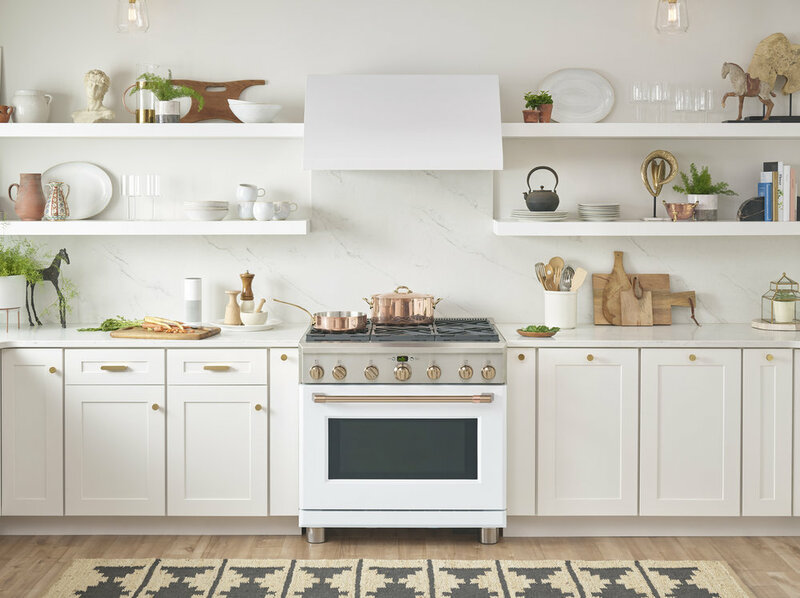 There have always been tons of options when it came to elements like your cabinets, countertops, finishes, and lighting, but it’s been pretty limited on the appliance front - until Café Appliances came along! The ability to customize the knobs and handles on their matte black or matte white appliances ups the game for kitchen design, and I’ve gotta say, I’m super excited about them! They can have a completely different feel depending on what option you choose (brushed stainless, brushed copper, brushed bronze, or brushed black). I love how these appliances allow you to take your kitchen to the next level and integrate them more fully into the overall look and feel of your design. See what I mean? Do you have a favorite combo? If you want to learn more about customizing your Café Appliances and are local to Philadelphia like me, head on over to Gerhard’s Appliances - the kind folks there can definitely help you out. They place a huge emphasis on customer service as well as offer competitive pricing. It’s the best of both worlds: a more personalized experience as well as a great deal. I know that when I’m getting ready to invest in something as significant as appliances, both of those are definitely important, and if I have the opportunity to keep it local at a retailer like Gerhard’s, that’s even better!